We put together a comprehensive disability remodeling cost guide. You will find a complete cost break down for each type of disability remodeling. Life in a wheelchair and confinement to the house is a scary prospect for the disabled persons. While some people do plan for aging in place and gradually adapt their homes for that eventuality, it is uncommon to plan and prepare for early disability. An accident or illness may force a remodeling of the home for disability. For the disabled person, the outside world is neither comfortable nor accommodative to their needs so the home is their best refuge. They have to adopt a radically different lifestyle in which they are more dependent on extra aid to perform every-day activities such as walking, bathing, climbing stairs, cooking, and so forth. They still need their dignity, privacy, independence, and convenience, so the home must be remodeled or adapted to make it accessible, safe, livable, and comfortable. Adaptation – Adaptation is a minor addition or alteration to an existing fixture. Aging in place – Remaining in your original home into old age. This allows you to modify the home in advance and as you see fit. Universal Design – This is a concept of creating fixtures in such a way that they are accessible and comfortable to use by both abled and disabled persons. Such designs are a compromise between the needs of both types of users. Remodeling revolves around the bathroom, stairs, kitchen, hallway, bedroom, living room, deck, and the yard, and the cost can be quite high especially where assistive-technology is involved. HGTV and ImproveNet.com estimate that the cost of a low-budget remodeling is $9,000 and a major remodeling with technology-assisted installations costs between $40,000 and $150,000. Owning a home is a significant investment and some of the projects and costs of remodeling for disability are listed below. The bathroom is the major focus for remodeling for the disabled. The costs of walk-in or disability bathtubs by type are as follows. The common types of disability include medical, physical, mental, and aging conditions, including arthritis, cardiac, bariatric, autism, downs syndrome, Alzheimer’s, cancer, spinal bifida, amputation, blindness, deafness, immobility, dwarfism, and albinism. Mental conditions include autism, Alzheimer’s, and PTSD. Aging leads to a deterioration of physical and mental ability. Home remodeling adapts the living space for the disabled persons so that they can still live safely and independently. Hearing deteriorates with age, and with it the use of telephone, according to LDSG. Remodeling aims to equip the user with sound-amplifying devices, vibrators, flashing lights, and intercom bell. Direct the user to a quieter corner of the living room. Use soundproofing to keep the place quiet and to enable the person use a high volume in the entertainment room. Remove sharp noises by installing a carpet or cork flooring and curtains on the windows. 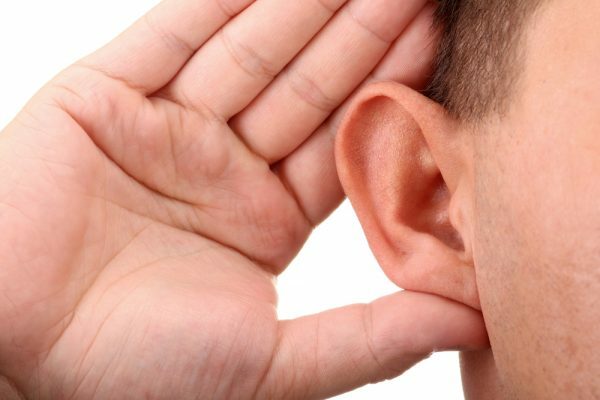 The cost of remodeling for the hearing loss is between $1,000 and $3,000 for minor remodeling, and between $2,000 and $15,000 for soundproofing. One in twenty elderly persons is legally blind, and a large majority have poor vision. They cannot discern colors, judge distance, or refocus their vision quickly, so they end up in accidental collisions and falls. Remodeling creates a safer environment by clearing passageways and marking items in contrasting colors. Furthermore, brighter lights are installed, antiglare paint used on glossy surfaces, and the color scheme is changed to red-orange-yellow spectrum which clearest for them to discern. Adjacent object colors are contrasted, for example the tablecloth and tableware, treads and risers, and shower seat and the floor. Remodeling for visibility by DIY costs between $500 and $1,500. 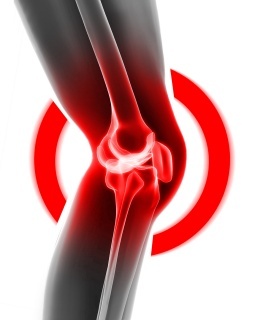 Arthritis is common among the aged and it causes stiffness and excruciating pain to joints. The person’s mobility and physical fitness are greatly reduced. They are unable to grip or apply force on even simple tools and appliances, therefore you need to replace knobs for levers and handles, and cover handrails with rubber or leather for grip. They are often confined to a wheelchair, which although offering some relief, is inflexible. The arm sweep from a wheelchair is only 46” forward, 9” sideways, and 12” downwards, therefore everyday items have to be placed within reach. The cost of DIY remodeling for arthritic disability is estimated at between $100 and $300. Persons with a heart condition are unable to exert their bodies, even to climb the stairs. You have to relocate their bedroom, furniture, wardrobe, and gadgets to the ground floor near the bathroom and kitchen. Clear their pathways of obstacles. You have to keep their essential items where they can easily reach them. The cost of relocating the bedroom and the personal items furniture is between $300 and $2000. Adaptation would cost a further $500 to $6,000. Most people do disability remodeling with an intention of living in the house permanently. A paralyzed person is unable to move about easily. A person with mental illness may be disoriented and prone to falls. The focus of remodeling will depend on the disability, for example, paralysis may require a ceiling lift, arthritis and joint pains may require changing to levers and handles instead of knobs. A major remodeling for frailty is to acquire a walking aid such as a wheelchair, walker, walking stick, or a commode. The cost of a wheelchair ranges between $400 and $8,000 depending on design and features. According to LDSG as a person gradually ages, they experience age-related disabilities such as lack of mobility, stamina, dexterity, flexibility, sensory response, and mental coordination. They lose the agility to navigate the stairs, bathroom, or bend and stretch. They become frail, disoriented, dizzy, and suffer a myriad of illnesses that result in disability. 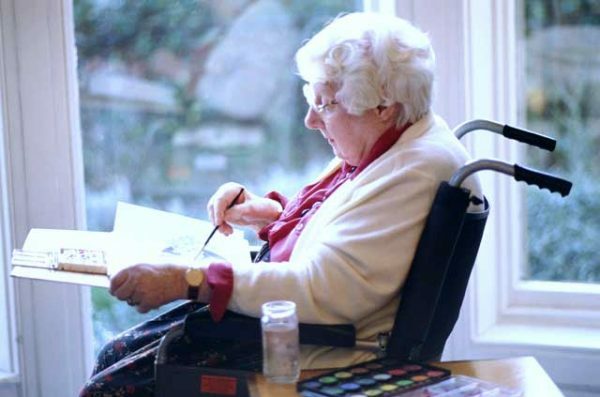 LDSG further observes that most homes are not designed for aging disability. 83 percent of elderly people would rather remain in their current homes than live a nursing home. Moreover, a nursing home would cost $50,000 per annum whereas a onetime comprehensive remodel would cost less than $40,000. In anticipation of future needs, disabled people adopt the UD concept, which merges the needs of the disabled and the abled into a common design, for example raising the toilet by three inches, adding grab bars with rubber grip in the wet areas, installing roll-out drawers and variable height counters, and replacing the drawer, cabinet, door and faucet knobs with handles and levers. According to the National Center for Disease Control and Prevention, home modifications can prevent 50 percent of disability-related accidents at home. Measures like these cost between $200 and $1,500. You can plan and start your remodeling for aging in place early and ensure your future independence and comfort. As noted by At Home Contracting, Inc., elderly and disabled people prefer staying in their own homes than staying in a nursing home. You can also remodel to accommodate a disabled member of your family. It is however difficult to get a landlord to assent to a radical remodeling for disability and you may not stay in that house permanently. Age-related disabilities begin to show at 50 years of age and accelerate after 65 years. Other disabilities are caused by accidents, severe illness, and birth conditions. Many forms of disability are accompanied by reduced mobility. Materials for remodeling for disability and aging in place cost far more than for regular remodeling. The labor is mostly specialty job with little room for DIY. Some possible DIY tasks are obtaining permits, clearing debris from the worksite, and minor adaptations like changing faucets, locks and hinges. When remodeling you should comply with the Fair Housing Amendments Act (1988), Rehabilitation Engineering and Assistive Technology Society of North America (RESNA), Americans with Disabilities Act, and other codes. LDSG notes that remodeling can be done by installing simple aids like grab bars at $140, or complex fixtures such as a lift for $15,000. In many cases, you need a standard remodel of $9,000 and sometimes you need a comprehensive remodel costing more than $40,000. Every remodeling project is unique and depends on the type and severity of the disability, the house structure, and composition of members. In some remodeling projects you may qualify for disability remodeling funding from the state or private organizations. Disability remodeling takes care of accessibility, adaptability, universal design or UD, and viability. 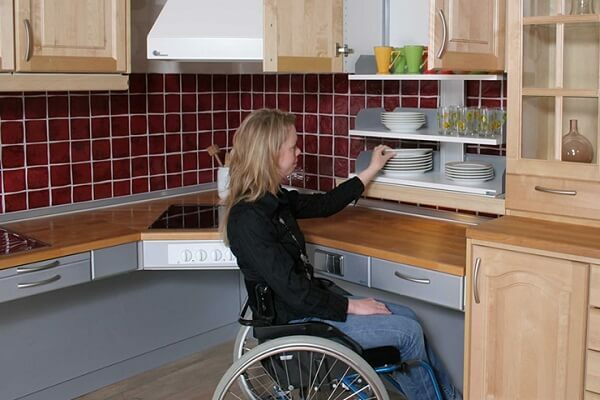 Adaptability allows for tweaking of the existing setup to accommodate the needs of a disabled person, for example installing grab bars and roll-out shelves. In UD, the house is designed to take care of the needs of both the abled and disabled persons equally, for example having a wide hallway and raising the toilet level. Viable features are installed in a “normal” homes for the comfort of disabled or aged guests, but are also useful for the abled people, for example the ramp and handrail made move easy for all. The wheelchair is one of the most used mobility aids in and out of the house, which gives the user a sense of freedom and independence. Other walking aids are the walking stick, walker, clutches, and the caster commode. Remodeling for disability emphasizes the facilitation of mobility aids, including the installing of a ramp, lift, elevator, chairlift, staircase, and so forth. It is crucial that the hallway and doorways are wide and passable by a wheelchair. Widening the hallway involves demotion and rebuilding the wall for about $20 per foot-length. Remodeling for disability is a major and complex project that is best done by a Universal Design Certified Professional (UDCP) who can customize the design, do it right, and guarantee the work against defects. 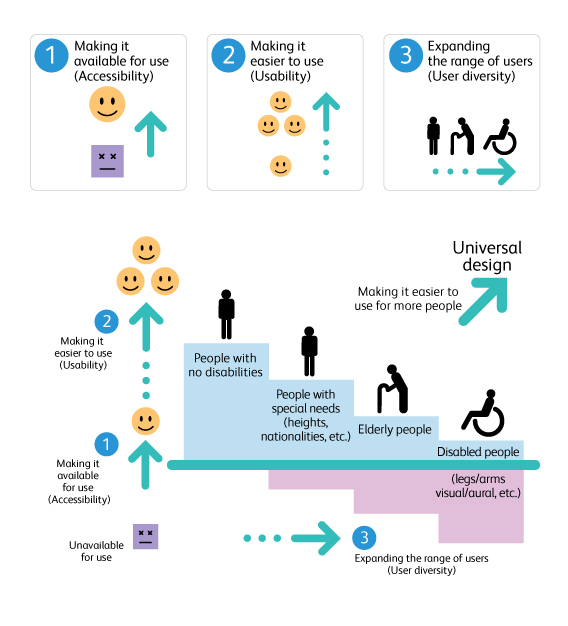 The UD operates on seven principles, namely; equitable access for the disabled and abled alike; tolerance for errors or inaccuracies in construction; flexibility of use by different types of users; low physical effort in using mechanical devices; availability of space for approach and use by all persons; simple mechanisms; and understandable information such as signals and warnings. According to LDSG, it is possible to adapt the house for disability and aging on a low budget. Installations like grab bars, anti-slip mats, demolishing the underside of the sink or countertop, and so forth, can be done for less than $500. You can also adjust the height of switches, control panels, and fixtures to suit the height of the disabled, for example you can lower door knobs, change to a single, long-lever faucet, and set the lights switches lower at about 30” to 36”. Shelves and brackets in the kitchen and bathroom can be lowered to about 36” for comfortable reach for less than $500 and they do not alter the overall arrangement and décor of the house. Moreover the changes are easily reversible. Even if you do not have a disabled person in the family it is still good to make provision for such an eventuality, for example an external ramp can be as appealing as stairs, hallways can have rounded instead of sharp angular corners for easy maneuvering of a wheelchair or walker. Hallway doors or gates should be easily demolished and indoor steps can be replaced by a gentle ramp. Face the control panels on appliances and equipment towards the front side in order to help the disabled reach them easily and minimizes risk of accidents. The finished floor affects mobility and safety. Floor materials should be durable to withstand the pressure of caster wheels and wheelchair wheels. Laminate, vinyl, and concrete are suitable because they are durable and affordable, while wood is suitable but expensive. Cork is stylish and comfortable, but it wears easily under the punishing casters and wheels. Rough wood, and concrete are firm and aid movement, while rugs and carpets are difficult to wheel over. Ceramic tile, polished wood, stone, and loose surfaces like rugs are smooth and skiddy. Hard material give a hard knock in an accident, but they help to amplify footsteps for the hearing impaired. The cost of refinishing the floor for disability ranges from $750 for vinyl and $5,000 for wood and anti-slip tile. Remove barriers and obstructions from all passageways for a safer environment. If the primary concern of a door is privacy rather than security, then replace the door with a curtain or screen. Curtains cost about $80 while screens cost $150. Make it easier to open the door by installing an automatic door with motion sensors, power buttons, and PIN-card keys. Instead of dismantling a door you may choose to install wide-swing hinges, which can add 2” to the width of an open door. An automatic door costs $2,500 to install while a set of wide-swing hinges costs just $120. Fence off outdoor areas that are hazardous to wheelchairs, for example the swimming pool, gazebo, outdoor spa, and steep slopes. Doorsteps, thresholds, fluffy rugs and thick doormats can hinder wheelchair movement. Install handrails in the hallway, bathroom, kitchen, staircase, ramp, and outdoor features. The cost of a comprehensive remodel of passages would be between $300 and $1,000, and about $2,500 to install an automatic door. Electrical switches, dimmers, thermostats or sensors, outlets, and other control panels should be accessible to the disabled user, therefore should be lowered to about 36” or lower. Lights should have the correct intensity and angle for the visually impaired to navigate their way. If the budget allows, get a fully electronically-controlled system, especially one that incorporate cellphone apps. Before you start a remodeling project you have to obtain a planning and building permit along with several other permits and inspections. The building permit will cost $250 for a small area, $500 for a larger area, and $200 for a lift, chairlift, or elevator installation. A demolition fee of $200, disposal fees of $100, fire suppression fees of $70, and so on, will bring the total cost of permits to about $1,200. Doors provide access and security to the house. The standard door and hallway are about 32″ wide while a shower or bath door is 27” wide. An ordinary wheelchair is between 24” and -27″ wide. The space needed to maneuver a wheelchair or a walker is at least 36”, and at least 48” for turning. The door landing should be at least 5 feet wide to allow for a wheelchair approach. If your door is at least 32” then you can add 2” width of passage by replacing the standard hinges with wide-swing hinges. Change from a one-way door swing to a full-sweep (180 degrees) that can be pushed open from either side. Full-sweep hinges cost $45 per set of three pieces. Change the knob for a lever and lower it to a comfortable UD-recommended height of 36”. A lever is easier to grip and turn and it costs $70 to install. For arthritic users a lever added to the key will make it easier to turn the key. Better still, you can install a power switch or even an electronic key such as a swipe card, keypad, or biometric system. The electronic (smart) key system costs between $300 and $1,200. Since the hydraulic door-shut system is resistant to opening, it should be either removed or replaced with an automatic door system worth between $500 and $1,200. 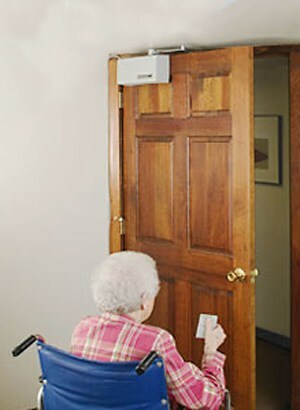 Add a plastic, wooden, or metallic sheet kick plate to protect the door from scratching by the wheelchair. Create a see-through (glazed) pane in the door so that the disabled person behind the door can be seen clearly. Where security is an issue, install a peep hole, latch chain, and intercom to the door. These measures will cost less than $300. In all, overall remodeling the door for the disabled costs between $200 and $6800 for a standard adaptation and between $800 $1,800 for major remodeling. A fully-featured and automatic retrofitted door will cost between $1,000 and $3,000. A narrow hallway with sharp bends and doors hinders disability movement. Widening the hallway requires demolition and rebuilding the walls, which can cost $4,500 for a 15-foot length or $300 per foot. The window should have a long handle, fastener or latch for easy turning. A switch-operated shutter will add convenience. Remove the threshold across a passageway in order to prevent tripping or obstruct wheelchair movement, and replace them with small ramps or bevels. AARP.org and MetLife.com observe that in many cases the bedroom needs only minimal changes such as widening the doorway into the room, lowering the switches and electrical fixtures, rearranging the room for wider passages, using wheelchair-friendly carpeting instead of rugs, and installing double-hung windows that have mechanisms for easy opening and cleaning of windows. The closet doorway may have to be widened too or removed altogether to enable a wheelchair passage. The reachable shelves, cabinets and drawers should be adapted in the same manner as the kitchen storage. A center island or vanity should have an underside space for wheelchair roll-in. The bedroom remodel normally costs less than $700, closet remodel range between $200 and $2,000, and a double-hung window range between $600 and $1,500. A grab bar is installed for gripping and supporting the weight of a disabled person at the hallway, stairs, ramp, and in the bathroom. They assist to lower a person onto the toilet seat, shower seat, wheelchair, or to walk along the passageway, ramp, and the swimming pool. They are part of the UD concept because even able-bodied users can benefit from them. They also act as towel hangers in the bathroom. It is recommended that they should be installed by a professional who can also assess the structural strength of the wall being fixed. ADA guidelines state that a grab bar should have a diameter of between 1.25” and 2”. It must be firm, non-rotating, well-gripped, smooth, at 12” clear of other wall fixtures like a soap dispenser, and capable of supporting 250lbs. A vertical grab bar is used for rising, for example from a bathtub or shower seat. A horizontal bar at 36” height is used for walking along the hallway, bathtub area, and stairs. An L-shaped bar is used for turning at a landing or hallway corner. The grab bar length depends on the purpose and distance it serves, and it is between 24” and 48” long. A 24” long grab bar can be installed for just $80 and a 48” long bar costs $120 to install. The wall may need to be reinforced before drilling the holes for screwing on the escutcheon. For extra help in rising you can get a Super Pole which costs $80 to $120. A $40-shower chain assists in transfer to a wheelchair. The total cost of installing grab bars in the bathroom ranges between $250 and $500. Hallway and kitchen grab bars can cost between $100 and $400. An elevator carries passengers vertically between floors. It is convenient because it requires a relatively small space, allows the wheelchair to roll in and out, is effortless to operate, and it accesses all floors. It also a UD that improves the house value by up to 50 percent. The elevator needs a 60” landing at each floor for maneuvering the wheelchair easily. The building code limits the size of a house elevator to 18 square feet, and you have to obtain a special installation permit for $200. Installation is a specialty task that is only done by manufacturer-appointed engineers. The architect can help in design, and the electrician and carpenter help in finishing and décor. After identifying a location in the hallway or near the staircase landing, you will have to annex space from the nearby closet, living room, bedroom, or hallway. Some elevators are bumped out on the external wall. The elevator can have a capacity of one, two, or four people. Residential elevators can be hydraulic, pneumatic, and traction types. The hydraulic elevator uses a mechanical arm to elevate the cage. It requires extra space for the hydraulic mechanism and its sides are concealed behind a wall, door, or bookcase. The hydraulic elevator costs about $20,000 to install doing a new construction and $30,000 to retrofit in a remodel. A pneumatic or vacuum elevator uses a vacuum and air pressure to move the cage, which is encased in a transparent tube. It has a carrying capacity of between 250lbs and 450lbs, or a wheelchair and user. It has basic and few features and costs around $10,000 to purchase and $5,000 to install. A traction (cable) elevator slides up and down a track and is balanced by counterweights. It has a high capacity of up to four persons, and advanced features like one press button, intercom, and backup battery. The traction elevator is normally built into a new house and can cover several floors. An original installation costs from $40,000 while a retrofit costs from $50,000. Although the disability elevator is considered a luxury fixture, it is a medical expenses and qualifies for tax deductible expenses in some states. However, you will still be paying the annual fee for elevator and lift inspection, which is about $75. A motorized chairlift, aka stair lift or stair glide, glides up and down the staircase on rails that are firmly fixed to the wall and following the same path as the staircase. It is powered by a rechargeable battery or from the mains electricity. It is designed as either a chair to sit on or a stair elevator to carry a wheelchair. It is cheaper to install than either the elevator or the lift. A straight chairlift slides on a straight path and costs between $3,000 and $5,000. A curved chairlift glides on a curved path and costs about $10,000. 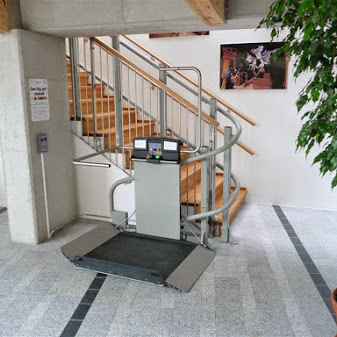 A stair elevator is a heavy-duty roll-on platform that carries a wheelchair. It costs between $5,000 and $10,000. A customized chairlift with such trappings as leather finishing, armrests, a swivel, weight sensor, battery backup, and control panel, would cost between $12,000 and $20,000. The installation cost of the chair lift ranges between $2000 and $5000. 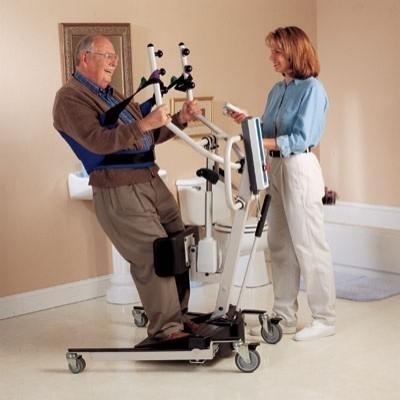 The lift is a device for hoisting an immobilized person from the bed or wheelchair using a sling. It makes it easy and safe to transfer a person from the bed onto a wheelchair or to another room. Lifting capacities vary between 450lbs and 1000lbs. Lifts can be manual, two-function, or full- or four-function. The manual lift is operated by a hydraulic pump and levers, and travels by pushing manually. It costs about $650. The two-function lift uses an electric motor to hoist and turn, but travels by pushing manually. The lift costs between $1,600 and $4,500. A full-function lift can hoist, turn sideways, and travel electrically. It is controlled from a panel. It features speed control, emergency stop, and overload sensor. The ceiling lift is a full-function, aesthetically designed sling lift that is bolted to and suspended from the ceiling. It has tracks to different rooms and floors. However, it is complex to install and requires an unobstructed ceiling, a concrete subfloor, steel joists, and a wide doorway. The lifting unit is permanently attached to the tracks. The system costs up to $14,000 and $6,000 to install. The wall-mounted lift is used where a ceiling lift is not practical. It requires mounting on reinforced wall joists. It is also a full-function lift but used only within a room. It costs between $3,500 and $8,000 and $3,500 to install. The floor lift or suspension lift is a heavy-duty, two-function lift built on the floor with two beams and a suspension bar with tracks. It costs $6,000 to $9,500 and $500 to install. The portable lift is a mobile floor lift on caster wheels. 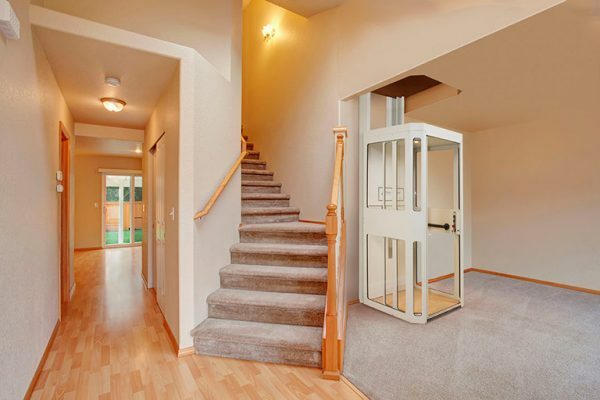 Guldman’s motorized lifts with smooth start and stop cost between $1,960 and $2,360. Prism makes hydraulic floor lifts for $2,030 and permanent ceiling lifts for $5,700. SureHands makes automatic start-stop lifts for $3,420 to $5,410. The standing lift is used to raise a disabled person into a sitting or standing position and lower them into a bed, chair, or wheelchair. It is recommended for persons with motor control and a strong torso to hold onto the device. It is portable, height-adjustable, and has a lifting capacity of more than 400lbs. Some popular brands at Rehab Mart include Invacare, Prism Medical, Polaris Medical, Romedics, among others. The device is simple in design and can replace the wheelchair in some cases. The battery-powered standing lift from Rehab Mart costs somewhere between $2400 and $7,000. The Alliance Patient Stand Aid is a manual standing lift that costs just $780. A Hoyer lift or floor lift is used to hoist a severely disabled person into a sitting position or onto a bed, wheelchair, or commode (Joerns). The user is secured with padded slings and suspended in a standing position. The lift is motorized and freestanding. It is also portable, lightweight, and has a lifting capacity of up to 850lbs. A typical Hoyer lift from Joerns costs $1,500 on the low end and from $6,000 to more than $12,000 on the higher end. A manual or hydraulic Hoyer lift costs about $880. The battery costs $220 to replace, the cradle sling chain costs $35, a digital weighing scales costs $1,050, and the hydraulic pump costs $250. Lift slings and safety straps are designed for different disabilities. Basic slings for general use cost between $80 and $400. Hygiene slings for toilet assistance cost between $70 and $240. Sit-in slings for extended period of suspension cost between $250 and $400. Disposable slings cost $40 each. At RehabMart.com, universal lift straps cost from $200, while medical lift straps cost $95. Auto-weighing scales cost from $200 to $500. A low-end lift battery costs $15, while a heavy-duty, Hoyer battery costs around $250. Since the lift is considered a luxury item it does not qualify for state grants, exceptional circumstances. The lifting capacity of the lift includes the user, wheelchair, and some fair load such as groceries. Low-capacity battery units cost $15, while heavy-duty, long charge batteries cost as much as $250. The stairs should be widened and reinforced to UD standards in order to allow both the chairlift user and stairs user to share space safely. Many manufacturers have appointed installation engineers who are experts for their specific brand and models of lift. They incorporate the installation charges in the price of the system. You will still need an electrician and a carpenter to do some fixtures and finishing for about $450. Reconditioned lifts can cost under $1,000 to buy and install, while DIY kits, such as those sold by AmeriGlide, can half the cost of installation. The LDSG notes that the kitchen is a hazard area for the disabled because of the risk of scalds, falls, and falling objects. The kitchen has many types of appliances and utensils that get in the way. Kitchen remodeling includes redesigning the kitchen layout, adapting fixtures to UD standards, and adjusting the level of the countertops. Overall kitchen remodeling could cost between $3,000 and $20,000. The kitchen floor should have enough unobstructed space for a wheelchair to navigate around. When redesigning the kitchen, adopt a three-point food-making schedule that includes preparation, processing, and cooking. In the preparation schedule, foods stored in the refrigerator and shelves are retrieved and cleaned in the sink. In the processing schedule, foods are chopped, mixed, and processed on the working tops using knives and appliances. And in the cooking schedule the burners, stove, microwave, and oven are used. This is also the most challenging point for the disabled because of accidents and risk of fire, and you need to be alert and fast-acting. Position the switches and appliance controls on the front panel which is safer and convenient. Other kitchen modifications include a freestanding worktable with a wheelchair underside, a high stool for keeping the back straight, and a sling strap attached to the counter for supporting the back and weak legs. The stool costs $110 while the string straps cost $35. Create working tops out of the countertop, pull-out top, drop-leaf top, lapboard, and tabletop. They should be at elbow level in order to reduce back strain. Redesign the deep storages like drawers, cabinets, and shelves as pull-out (Lazy Susan) storage, located at heights of up to 36”. ImproNet.com advices that you install adjustable-height countertops for all users and which cost between $300 and $800. Remove the under-sink cabinet, mechanical garbage compactor and disposal system, and exhaust fan to create room for the wheelchair to roll in. The sink should be shallow in order to avoid straining the back when bending to reach the bottom of the sink. Replace the low pedestal sink with an in-wall sink or a countertop design that allows a wheelchair to roll in. Insulate the piping of the drain underneath to prevent scalding by hot drain water. Arthritis patients find it difficult to grip and turn the faucet knobs, which can also scald the hand. Install a long, single-lever faucet attached to a two-foot flexible and insulated hose pipe. The cost of upgrading would be $200 to $700 for the sink, $250 to $400 for the faucet, and $150 for insulation (HGTV). Frequently-used tableware, utensils, and spice jars should be stored to the front of the storage area. Cooking aids like pans, ladles, jugs, and jars are stored on open racks and hooks, and in the lower shelves and cabinets. For ease of opening, install roll-out drawers, shelves, and cabinets, and replace their knobs with grip handles. Roll-out design enables access to deep storage. Food items should be placed in the lower racks of the refrigerator and upright freezer, and near-side of the horizontal freezer. A kitchen cart is useful for transporting utensils and food. A trash compactor helps to reduce the number of trips to the garbage area, but the system should be installed outside the sink underside. Remodeling the storage space will cost between $500 and $2,500. The cart would cost $300 and the garbage compactor will cost another $250 to $400. The burner layout of the cooktop should be staggered, with front-operated controls, for easy access to the back burners by a wheelchair user. Insulate the underside of the cooktop in order to protect from burns if there is legroom for a wheelchair user. For the sake of safety, the oven should be located apart from the cooktop, instead it should be wall mounted. A replacement cooker will cost some $500. The tableware should have lips for easier grip by unsteady hands. Contoured glasses and cups help with grip. You can have appliances for cutting, chopping, whipping, and other food processing tasks. This makes it easy for the disabled person to carry out their cooking tasks. The cost of replacing tableware would vary greatly, but starting at $200. The staircase is the most accident-prone area in the home after the bathroom, according to ImproveNet.com, They are difficult and tiring for the disabled and elderly to climb. There are three ways to resolve the staircase problem in line with the needs of the disabled person; adapt it for disability; replace it with a ramp; or create an alternative route. The ramp enables navigation using a wheelchair, walker, cane, or caster-wheeled commode, and can be installed in the hallway, at the house approach, or in the yard. The standard outdoor ramp is 16 feet long. It is made of steel, concrete, wood, brick, or stone. Cork is also used because it is strong and cushions against an accidental fall, but it wears off easily under wheels and casters. A simple or small ramp can be a DIY, but most installation projects are best done by a contractor. For a permanent ramp you will need a building permit that costs $200. 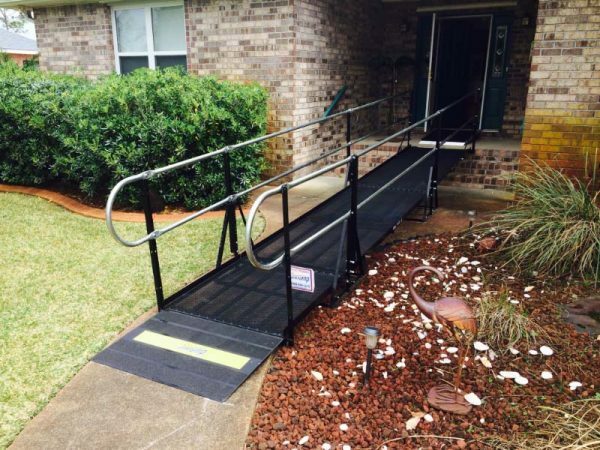 The ADA code recommends the minimum measurements of the ramp, including width, slope, landings, capacity, and safety features like handrails and the ramp edges. The outdoor ramp should be 44” to 60” wide, 1:20 slope, and a maximum of 30” rise between landings. If the ramp rise exceeds 6” or has drop-off edges then it should have handrails on both sides. The rails are 34” to 38” high and they protect a wheelchair user and visually impaired person from falling over the ramp. The indoor ramp should be 42” wide with a gradient of 1:12, although 1:8 is acceptable for a powered wheelchair. A ramp should support at least 250lbs weight. A low gradient is safer from toppling over with a wheelchair. The ramp should be finished with anti-slip material such as paint mixed with fine sand, unpolished stone, or course carpet. There should be two landings; a bottom landing to prevent veering off the ramp, and a doorway landing to allow for door opening from a wheelchair. For a long ramp, install a midway landing for resting. Install curbs, railings, or walls the outdoor ramp. 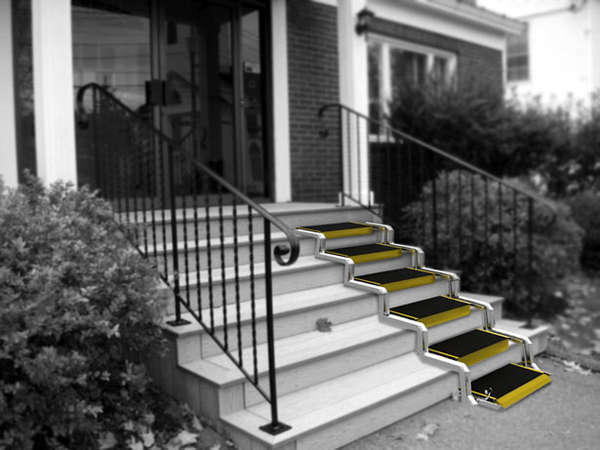 Replace small staircases with a ramp, and remove curbs, sharp thresholds, and other obstructions from ramps. Battens and diagonal broom strokes improve the footing on slippery ramp. The ramp is cheaper to install than a lift, but it is only suited to places where the rise is less than five feet and there is enough horizontal run for the ramp and the landings. According to Improvenet.com, a 16-foot prefabricated and portable aluminum ramp costs $3,750, a permanent steel ramp costs $3,500, and a wooded ramp costs $4,000. The adjustable steel ramp costs up to $6,500. Handrails on both sides of the ramp will cost $1,200. An anti-slip finishing of paint mixed with fine sand will cost about $200. The ramp installer and an assistant will charge between $960 and $1,500 to complete the installation, while the electrician will install the ramp lighting at a cost of $300. Overall, a simple ramp can cost just $100 to install while a high-end ramp can cost $20,000. The staircase should be made safer for a disabled user. The main remodels include adding handrails, covering the risers, and making the treads anti-slip. The staircase handrails should be finished with a material that has a good grip, such as rubber, leather, or sand-grained paint. The rise should be gentler at 4” instead of the traditional 7”. It should not be open since it can cause tripping catch the foot. It should be covered and the blocks beveled at the nosing in order to avoid catching the toe or tip of the sandal in them. The bottom landing should have a cushioned wall finishing such as cork, wood, or carpet, which would absorb the impact in case of an accidental fall. The adaptations to the stairs and handrails would cost between $200 and $1,200. However, the staircase may need to be overhauled in order to create a wider staircase for a chair lift. Such a remodel will cost about $6,000 (see our article on Basement Staircase Remodeling Cost Guide). You can convert a small staircase into a gently-sloping ramp. The staircase needs adequate lighting, especially when a visually impaired person is involved. For $200, you can add extra light fixtures between landings. The bathroom is on most disability remodeling menus because it is a therapeutic yet accident-prone retreat for the disability and aging in place. Danger larks on the wet floor and the high edge of the bathtub. Using the toilet is cumbersome and painful in the knee joints. UD standards can be used to create a safe and comfortable, user-friendly bathroom. The areas of remodeling include the door, handrails, grab bars, flooring, toilet, vanity, shower, and bathtub. In bathroom storage you need extra space for equipment, medicines, and tonics, besides the regular storage for linen and toiletries. All storage areas must be accessible within 36”. High shelves and deep cabinets will not be useful. The sink and faucet have to be within safe and easy reach. An anti-slip floor finishing reduces accidents in the bathroom, while grab bars will give support for frailty. Lighting for those with poor vision will be bright to promote visibility. Proper GFCI will reduce the risk of electrocution. The ADA code for bathroom design stipulates that a roll-in shower measures at least 36” by 36”, has a shower seat opposite the faucet, and a 5’ long shower hose with a handheld showerhead. The shower curb should be sloped and less than 0.5” high. The fore walls and tub edge should have grab bars or handrails. The shower door should be made at least 34” wide or replaced with a curtain. ADA compliance improves the house resale value as well as aiding the disabled family members and guests. The traditionally narrow shower doorway should be replaced with a 34” door or curtain. An in-wall grab bar should be installed opposite the shower unit. The stall should be either receded with a small slope or have a half-inch rubber curb that would not impede the wheelchair’s movement. The shower unit should be modified to have both the overhead and the handheld showerhead on a 5-foot long shower hose. Install a single long lever faucet for easy operation and a thermostatic valve to control hot water flow. 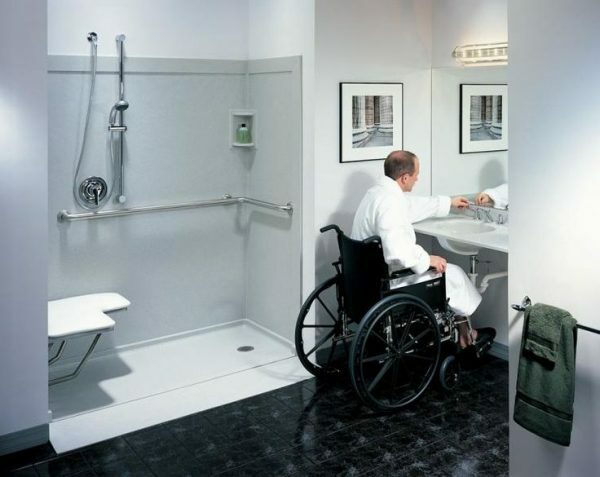 A roll-in shower should have a 15 square foot stall that allows a wheelchair or commode to be maneuvered in the shower. 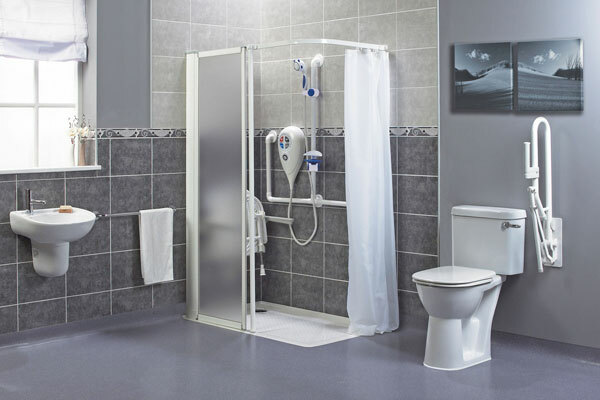 A transfer shower is designed for a disabled person to transfer from a wheelchair to the shower seat. Widening the doorway will cost $250, while a wide, glazed shower door will cost about $500 to install. The rail and curtain will cost about $140, while the receded stall will cost between $200 and $1,100 to modify. The main obstacle to using the act of stepping or swinging over the edge of the tub bathtub, especially when transferring a bariatric or disabled person from the wheelchair or commode. For $100 you can adapt the tub by installing a removable bathtub seat. However, a remodeling that involves installing a walk-in tub with a 15” walk-in door and built-in seat allows effortless walking into the tub, shutting the door watertight, and filling the tub with water. The door only opens when the tab is drained. A thermostat monitors and controls the flow of hot water and a single-lever faucet controls hot and cold water flow. An advanced tub system will have a control panel that presets the water temperature and pressure, whirlpool, and hot air-blast. The floor has to be refinished with an anti-slip material. A basic or soak tub with a built-in seat costs between $1,000 and $2,500 from manufacturers like Universal, American Standard, and Homeward Bath. An upmarket model with such trappings as remote pressure and temperature controls, whirlpool, and air-bath jets costs between $7,000 and $10,000 (see our article on Bathroom remodeling Cost Guide). The plumbing cost will be between $250 and $600 while the electrical fixtures, rerouting, GFCI, breaker board, and other installations will cost between $200 and $1,200. Refinishing the floor with anti-slip tiles will cost between $80 and $800, and a set of three grab bars will cost $140. Repair of plumbing will cost $200 and a replacement boiler or heater will cost $700. If you opt to retain the old tub then you might want to extend the ceiling lift tracks to the bathtub at an installation cost of $500. In total, the cost of remodeling the bathroom for the disabled can reach $9,000. Sturdy toilet grab bars are designed as sheltering armrests to support the person as they transfer between the wheelchair and the toilet, and sit on the toilet. 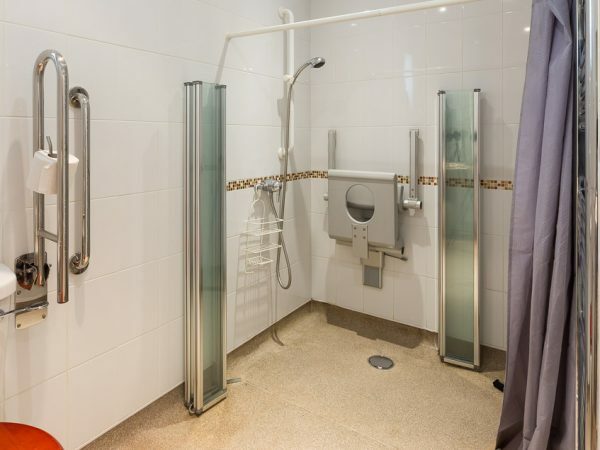 Anti-slip floor-standing grab bars support the body when lowering into the shower seat, while wall-mounted grab bars are installed in the shower and bathtub area to aid in dismounting from a wheelchair. Bathroom handrails are built at strategic places like the door approach, vanity, and storage. The handrail and grab bar grip is covered with rubber or other anti-slip material. A wall-mounted grab bar costs $80, while the armrest toilet bar pair costs $240. A pair of floor-standing handrails costs about $200, while a 5-foot handrail costs $100. Labor will cost between $150 and $350 to do all the installations. Some disabled persons have difficulty bending the knee and lowering onto the seat. The toilet should therefore be raised to at least 17” and a floor platform installed for shorter people to step on when using the toilet. A plumber can raise the toilet to 17” at a cost of $120. You can install a bidet for another $120 and armrest grab bars for $240. Convert the flushing mechanism to either a soft-button or a long lever at a cost of $50. The bathroom floor should be refinished with an anti-slip and anti-skid material. 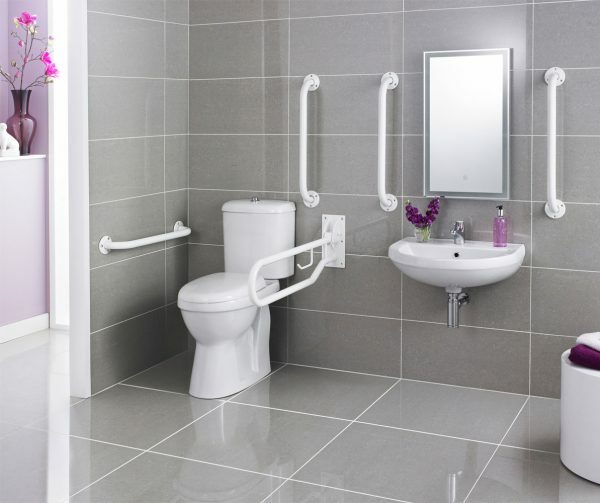 The passageway to the toilet, shower, bathtub, vanity, and storage should not be obstructed with curbs and thresholds, which hinder wheelchair movement and cause accidental tripping. Strong grab bars should be installed along the wall. The shower door should be widened to 36” for the wheelchair or commode to pass through. The bathroom should have bright but shielded lighting for people with impaired vision and to see properly when grooming. Ensure that the GFCI is properly installed and tested by a qualified electrician. Floor and passage installations will cost between $400 and $1,800, while the GFCI is installed at a cost of $500. If a remodeling projects costs less than $2,000 then you may not need financial help. For bigger projects you may require financing or a grant from the government or a private charity for the disabled and aged. The Architectural Barriers Act advocates for UD-compliant housing, while the Fair Housing Act requires that a building be accessible to the disabled. The Federal government funds disability assistive programs through Title III of the Older Americans Act, Rebuilding Together, Inc. Department of Energy Low-Income Home Energy Assistance Program, Medicare, and Medicaid. The. Contractors, banks, mortgage, financial institutions, and charitable organizations also chip in with discounts and philanthropic gestures. Other federal assistance programs include the Federal Housing Administration, which gives housing loans and grants to enable the disabled people to own and remodel their own homes, the Department of Veteran Affairs (VA) program which gives cash out refinancing on home improvement loans, the Special Housing Adaptation (SHA) grant for veterans to buy homes, and the Specially Adapted Housing (SAH) grant for improving the home and servicing housing loans in a disabled person’s land. Some private and government initiatives assist the disabled to improve their home environments affordably, for example, The National Council of State Housing Agencies (NCSHA), and The Rehabilitation Engineering Society of North America (RESNA), and Catalyst Project among others. In Maryland, The Department of Disabilities, Technology Assistance, loans portable ramps to the disabled. ADA enables disabled persons to own their homes, considering that many landlords are unwilling to allow significant remodeling of their houses for disability (HGTV). Some disability remodeling qualify for medical tax remodels. Home elevators come in a variety of designs, such as glass cages, metal walls, and wood panels. The customized elevator has extra features, such as interior and external control panels, an entertainment system, a cooling fan or air conditioner, and a lighting system. It also has wainscoting, faux painting, wood paneling, or tiles finishing. The exterior side of the elevator is concealed with an entertainment unit, shelves, framed wall paintings, and so on. The underside of countertops and sinks for a roll-in wheelchair is concealed with a curtain. The bathroom can be accentuated with a large and framed vanity mirror and a countertop flower vase. HGTV advices that the elevator décor matches that of the landings, because distractive décor is distressing and unappealing to look at. According to HGTV, the overall cost of décor ranges between $300 and $15,000 or higher.